Spring is here! The 2013 farm season has just begun. There are still puddles of water here and there in the fields, but the sunny spring weather has been helping the wet areas drying out fast. May is often a tricky month, though; it’s like a roller coaster….cold/warm, wet/dry, rain/sun…back and forth, back and forth. A little confusing, I must say. Hence, we continue to monitor our plants and the field conditions carefully. The greenhouse is filled with vibrant seedlings, and we have been transplanting quite a bit of spring crops out in the field….lettuce, kale, collards, broccoli, cabbage, beans, peas, bok choy, and herbs/flowers. Radishes, carrots and beets are also in. Mary, Pepe and I are all hard at work, getting ready for another productive year of the farm season. I have already noticed a sign of “abundance” just looking at seedlings….they are growing much better than this time of last year. Tomato starts are loving the recent warm weather. We may start planting them earlier than last year if High Tunnel dries out fast enough. We’ll see. Peas and beans are in….some of the early crops for the season. Fava beans is one of the new additions to this season. Rhubarb is one of the first crops we harvest this time of the year. We also planted several new crowns this spring so that we’ll have more rhubarb in a couple of years. Rhubarb is popular for sale, but hard to find organic. Besides new crop varieties added to this season, we have another set of new additions to the farm. Two baby goats! They were born over this winter and are growing well. They are keeping Pepe busy, too….and even driving him nuts! 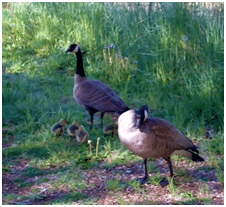 And one more…..geese had their babies, too! They live on top of the garden shed (living roof). Fifth graders from a local school came to volunteer conducted by Gretchen Johnson. They spent a couple of hours to plant and weed. 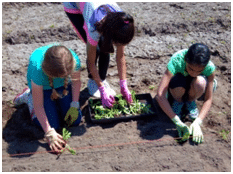 They learned how to plant lettuce, and also weeded our herb garden. Thanks, guys! You all did a great job!